2. In a large Dutch oven, melt 1 tablespoon butter over medium heat. Add onion, bell pepper, celery and cook in butter for 10 minutes until slightly browned (more than translucent). 3. Add garlic and cook for another minute. 4. Add crawfish tails, salt, black pepper, cayenne pepper and stir. 5. Add 2 cups crawfish stock. While keeping it on medium heat, slowly bring the mixture to a low simmer. Once it is simmering, turn off heat. 6. Add 1 tablespoon butter and stir until fully melted. 8. 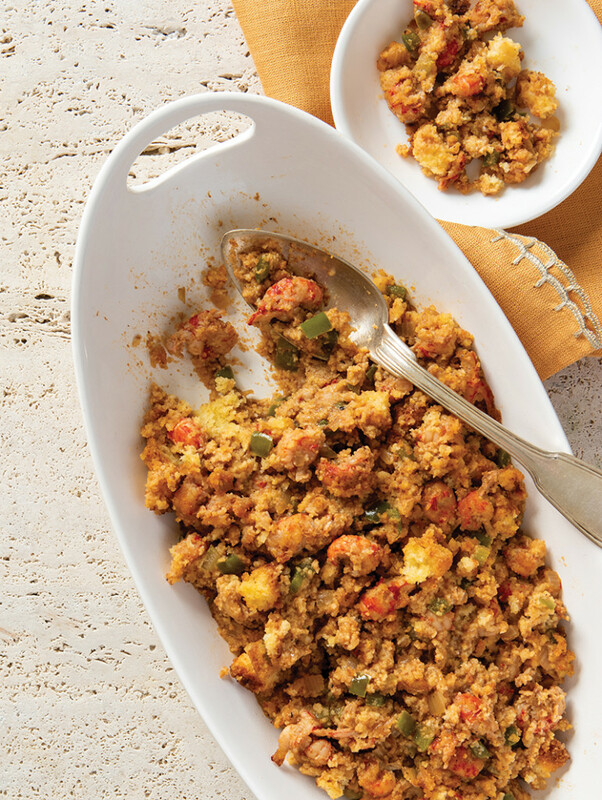 Scoop mixture into a 9-inch by13-inch casserole dish and spread out evenly. 9. Place the casserole dish in the oven. Bake at 400 F for 10 minutes. *Note: Chef Isaac’s mama used Jiffy Cornbread Muffin Mix in her original recipe. It can be used as a more time-efficient substitute. 1. Preheat oven to 350 F. Place 12-inch cast iron skillet in oven to warm as oven preheats. 2. Whisk eggs, milk, and honey together. 3. In a separate bowl, whisk dry ingredients. 4. Pour egg-milk mixture into the dry ingredients and mix vigorously with the whisk for 8 seconds. If it’s slightly lumpy, that’s OK.
5. Add melted butter and immediately mix vigorously with whisk for another 4 to 5 seconds. 6. Remove skillet from oven and pour in mixture. Place in oven. Bake for 30 to 40 minutes, until cake tester comes out clean. 7. Serve at room temperature with butter and cane syrup. Chef Isaac Toups was born and raised in Rayne, Louisiana. He owns and operates Toups’ Meatery and Toups South, and his first cookbook, “Chasing the Gator: Isaac Toups and the New Cajun Cooking,” publishes in October.